CD review: "A Truckload of Blues"
This review first appeared in the August 14, 1992 issue of the North County Blade-Citizen (now North County Times). 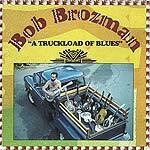 Musical chameleon Bob Brozman decided to dabble in blues for an album, apparently, bringing along his collection of dobros and National Steel guitars. If this is a tribute album to the Delta bluesmen, it's done well, with both technical skill and a sense of grace. His picking is, as always  whether it's Hawaiian, jazz, folk or, now, blues  excellent. Brozman's gruff vocals lend themselves well to covers by Robert Johnson and Howlin' Wolf, plus his own traditional-sounding originals and various traditional pieces. It just seems that Brozman, for all his talent, has yet to find his own voice and give back to the music more than historic preservation of different folk styles.